X-Small - $53.99 Small - $53.99 Only 4 left! Large - $53.99 Only 1 left! Is there a little one around your house that gets the special privilege of being treated like royalty? Do you wait on her hand and foot to make sure her belly is always full with chicken nuggets and macaroni and cheese? Do you lay her clothes out for her every day and act as her personal chauffeur whenever she needs a ride to daycare or a play mate's house? Yeah, it sure sounds that your little one is the queen of your house and we're sure that you wouldn't have it any other way! 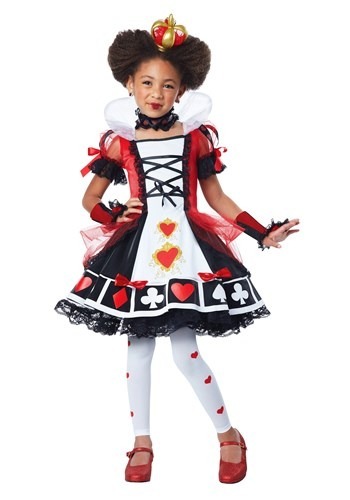 If your little royal one acts as a total diva, there is no better costume for her than this Queen of Hearts costume. First introduce your princess to the age old tale of Alice in Wonderland and if she has a true diva attitude, she'll connect with the Red Queen more than she will connect with Alice! 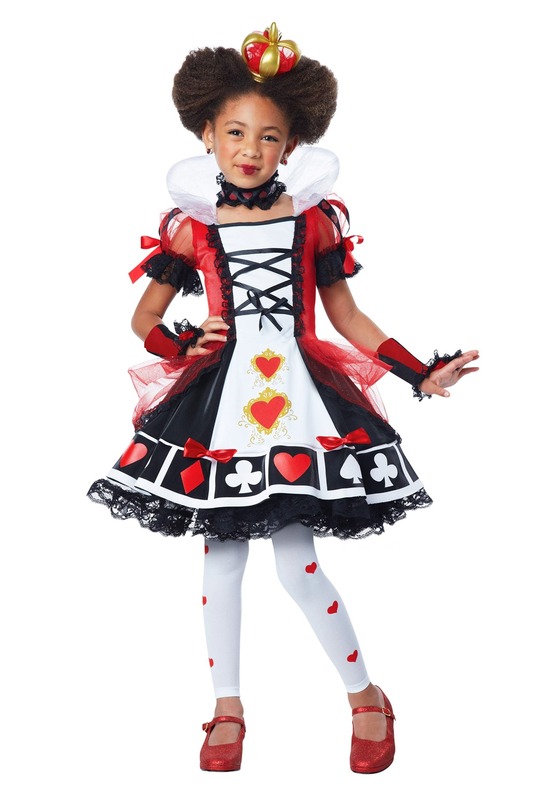 This deluxe Queen of Hearts costume for little girls is perfect for young ones who already show an intense passion for fashion. With girly bow details and fierce gold accents, she'll be ready to rule the household like it's her own personal kingdom. This black, red, and white short sleeve dress has a high collar which gives off that royal flair. The rest of the dress is designed to look like a deck of playing cards with diamond, heart, spade, and club designs. She'll love the tiny crown headband and the tights with heart shapes along the sides. Your tiny queen will love this costume so much that she'll really want to get into character. Before you know it she'll be requesting that you buy her a flamingo mallet so she can play croquet just like Wonderland's Red Queen!